As summer season kicks into high gear, ATI staff preparations for the new school year are well under way. In the area of data importation, the focus during school year transition is on new classes, rosters, and accommodating all staff changes a district or charter school may undertake between school years. 1) The district or charter school provides an export from their Student Information System (SIS) that lists all classes, teachers and students. 2) ATI staff import this data to a test database and perform a thorough quality assurance review – any problems are resolved with the submitter during the QA process. 3) ATI staff import the provided information directly into Galileo K-12 Online. Detailed instructions for GDI can be found in the Tech Support section of Galileo K-12 (and Pre-K) Online. Importation instructions are updated for each school year. 1) Be sure to include all the required information listed in the importation instructions in your file. 2) Optional information is not required in the Galileo database, but failure to include this information may adversely affect future report filtering. · Any omitted optional data can be imported at any time during the school year, either as part of GDI or as a separate process – contact ATI for more information. 3) If TeacherID or StudentID fields change within your SIS, please notify ATI prior to providing any import files to ensure proper transition within the Galileo database. Large-scale ID changes may require extra processing time so please notify ATI as far in advance as possible so we can help you plan accordingly. 4) Due to new class structures and teacher assignments, the quality assurance process is typically longest during the first upload of the year. Getting uploads underway as soon as data is available will help ensure adequate processing time before your first assessments of the year. Files often require a full seven business days to complete, so allocating extra time is beneficial. 5) Participation in Instructional Effectiveness (IE) initiatives with ATI may require a roster for all responsible teachers to be imported. 6) Participation in No-Evaluation Importation (NEI), the process of preparing for frequent updates to rosters and data within Galileo K-12 Online, requires three successive no-change imports at the beginning of each school year. Working alongside our import specialist to adjust your import format may be necessary during this process. In the next few months, ATI will launch several new application enhancements. The first of these is a significant revision of the online testing interface. The interface, released on July 6th, provides streamlined navigation and interactive features consistent with those found on state-wide assessments developed by PARCC, SBAC, and AIR. Testing tools in the interface (e.g., calculators, marked-for-review, strike-through and note capabilities) are designed to create a supportive testing experience for test takers. ATI’s many technology enhanced items are accommodated well in the interface for both district/charter-wide and classroom assessments. Additional bonus: The interface provides increased support for assessments offered through tablets. Galileo’s new testing interface provides streamlined navigation and testing tools (e.g. calculators, marked-for-review, strike-through and note capabilities). Contact one of our friendly Field Service Coordinators to schedule a Galileo Overview. Galileo K-12 Online Dashboards provide users a centralized location from which to view and interact with actionable, real-time data on student learning and instructional effectiveness measures. 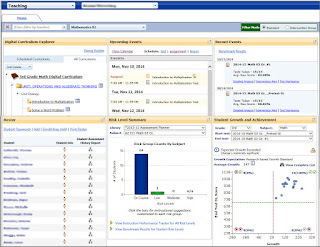 Galileo offers the Teaching, School Performance, and Instructional Effectiveness Dashboards which quickly provide multi-level vantage points to evaluate and manage the instructional environment across the district, school, classroom or individual learners. 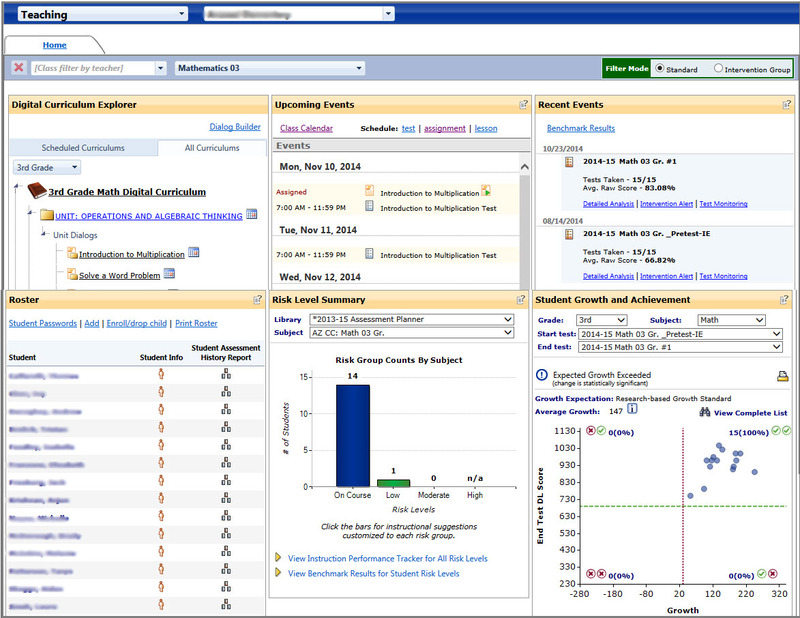 The information provided in each Dashboard is based on task sets and is briefly described in the following. The Teaching Dashboard enables teachers to implement curriculum as well as track individual student performance, class performance, and the performance of students in intervention groups. The Teaching Dashboard not only provides access to assessment results, but also supports instruction related to those results. from which to view and interact with actionable, real-time data. The School Performance Dashboard enables school- and district-level users to track student performance at the school and district levels. In addition to summarizing data for one or more schools, the School Performance Dashboard provides the results of state-of-the-art statistical analyses forecasting student performance on the statewide test and evaluating the effects of teachers and administrators on student growth. Districts implementing initiatives related to instructional effectiveness may also choose to make Instructional Effectiveness Dashboard available. The Instructional Effectiveness Dashboard enables users to obtain all instructional-effectiveness-related information in one place. The Administration tab, available to staff with appropriate permissions, contains technology to manage a complete instructional effectiveness system including tools to access and/or build proficiency rating scales, administer proficiency rating scales, and import/view staff files. Learn more about Galileo Dashboards.